Who Is Batman's New Enemy, Hugo Strange? 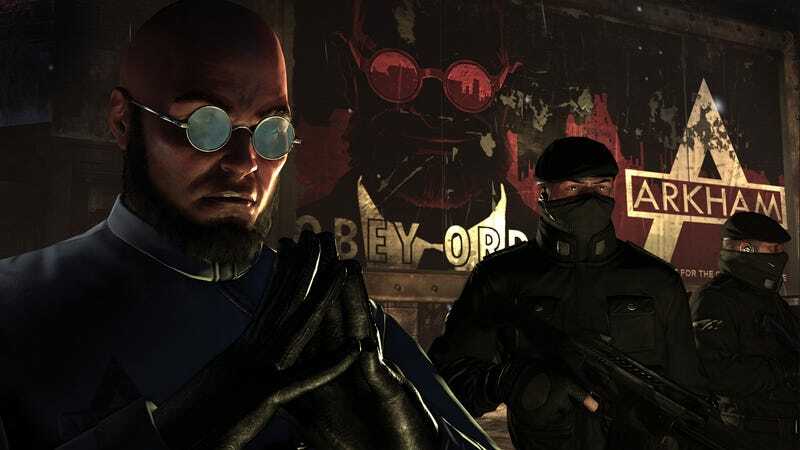 Hugo Strange is a major bad guy in the next Dark Knight video game, Batman: Arkham City. Who is he? He's a villain who has been around since before the Joker. And he's got an obsession. As you can see in the new trailer for Arkham City, Strange knows Batman's secret identity — and he flaunts it. Hugo Strange's knowledge of Batman's life as Bruce Wayne has been one of Strange's defining characteristics since he was introduced as a nemesis in Detective Comic #36 in 1940. In many of his various incarnations he's always been some sort of psychiatrist who has figured out who Batman really is. He also has shown a tendency to create serums that turn men into brutish henchmen. The Joker already did the serum-charged henchmen thing in 2009's award-winning Batman: Arkham Asylum game, but this secret identity twist would be a fresh addition to the game series. Strange didn't appear in Arkham Asylum except in the unlockable dossiers hidden in the game. Those files, reprinted here from a compendium of them on GameFAQs, clarify the kind of Hugo Strange we're getting in these games. Note that he doesn't appear to always know who Batman really is. According to a story about Arkham City in Game Informer , Strange is installed as the head of the so-called Arkham City in the new game. The City is the vision of the first game's Quincy Sharp, the Arkham prison warden who becomes mayor in the new game and decides that turning part of Gotham City's slums into a lawless home for prisoners is a good idea. Sharp puts the psychiatrist Strange in charge, a plan that sounds so foolhardy, the game's developers at Rocksteady better be ready to tell us that Sharp is 1) evil, 2) stupid or 3) being blackmailed. Hopefully Batman can save everyone. But... if Strange knows Batman is Bruce Wayne, any chance of us getting to play a bit as Bruce Wayne? Arkham City is out next fall for the PC, PlayStation 3 and Xbox 360.